Mangiamo! Let’s eat! 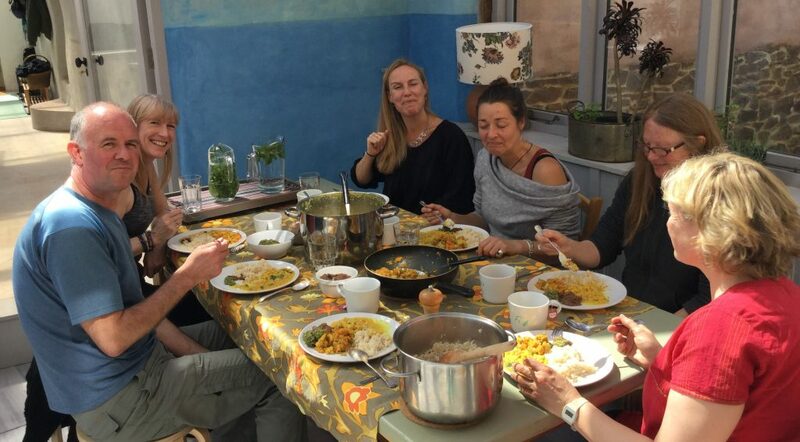 Eating together round the big table is at the heart of the retreat community here at Viveka Gardens Yoga Farm. Dhal, rice and subji – and maybe chapatti, but that’s another story – is a meal that will extend to feed all. You don’t want to miss out on chutney with tamarind, and for good measure we added a peamint chutney to this meal too. But the veg are key to the meal. Often we say vegetable subji but a participant told me recently at a cooking workshop at Made in Hackney that subji actually means vegetable. Anyway, vegetable curry.